Click the button below to add the Basketball Whistle With Filled Graphic to your wish list. Our engraved basketball whistle makes the perfect gift for a basketball coach. It is made of stainless steel. We engrave your engraved basketball whistle on top of the mouth piece. 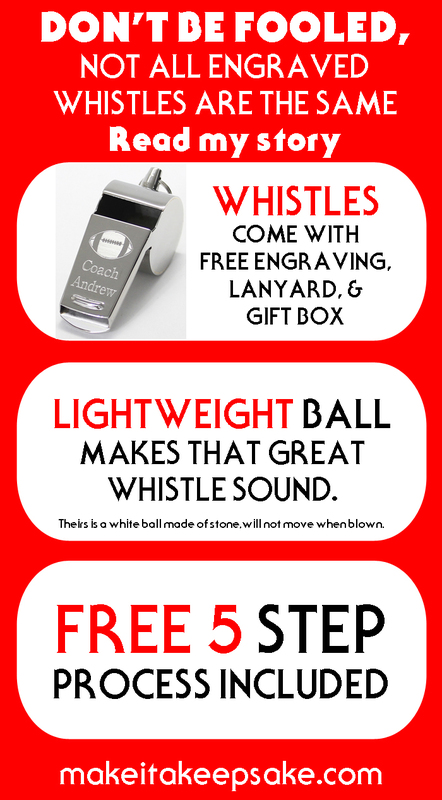 We can also engrave the back of the whistle, up to two lines of text as show in the picture above. If you want the back of the whistle engraved you must select yes in the Engrave back of whistle option. If you don't, it won't charge you for the extra engraving, and we won't engrave it. There is an extra $3.00 charge for engraving the back. The engraved text on the back of the whistle will be engraved toward the tip of the mouthpiece, as shown in the picture above, it will not be in the center. We engrave the basketball graphic and two lines of text up to 10 characters each line including spaces. You can engrave just one line of text with the basketball graphic. If you engrave just one line of text, then we will center the graphic and the one line of text in the center of the whistle (on mouth piece). If you are ordering more than one whistle and the engraving will be different on each whistle, you will need to fill out the personalization options and then click the Add to Cart button for each whistle being ordered. If you are ordering more than one whistle and the engraving is the same for each whistle, you will only need to click the Add to Cart button once, and when you get to the shopping cart, you will change quantity to the number that you need to order. The shopping cart will update the price. Basketball Keychain. Great for coach gifts and team gifts. I ordered a personalized whistle for my daughter's basketball coach. I received it and it is absolutely beautiful. I am very pleased and will buy from this site again. I ordered 2 whistles with basketball and name. They came out perfect, not only did they come out nice they also came in a cute box ready to wrap. My order shipped about 3 hours after I put my order in and the pricing was perfect. Thank you so much! Would definitely order again. The whistles were ordered as gifts. They were a big hit. The whistles looked good and didn't look cheap. The ordering process was easy and they shipped out fast. I will definitely be ordering again. I recently ordered 2 whistles for my daughter’s basketball coaches. You can engrave on BOTH sides. That was awesome. So they are engraved with a basketball and their names on the top, and “Love, Bella” with the year on the underneath side. The quality of the engraved is wonderful. For the inexpensive price, I thought it might look cheap. It doesn’t it is beautiful. It also came very quickly. Probably within 3-4 days, even though it said 7-10 days. They also package it so nicely! I would definitely order from this company again. Great experience! This is the second time I have purchased an engraved whistle from make it a keepsake. The whistles are great quality and the engravings are flawless. I also like the packaging they come in. People assumed I spent a lot more on this item than I did. It has truly made a wonderful and heartwarming gift for both coaches I gifted them to. It even brought a tear to one coache's eye. I highly recommend this, and will likely be purchasing more in the future. Received my order within 2 days! Absolutely love the quality. I will be ordering 2 more!